A Bright Future For Gateshead – Trinity Square Case Study - Ringtail Emergency Lighting. Northumbria University, situated at the heart of the North-East and home to over 35,000 students, has seen huge change in recent years as part of an enormous expansion and redevelopment programme. 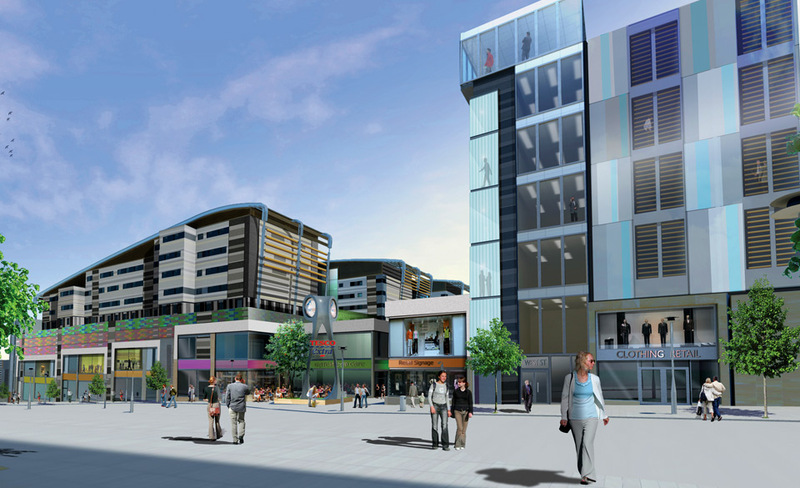 Trinity Square is a £150 million regeneration scheme established between Northumbria University, Gateshead Council and Spenhill Development. Accounting for around 20% of Gateshead centre, the project has been one of the largest building efforts outside of London. Trinity Square will generate a secure, vibrant and cosmopolitan living environment both day and night, creating space for 45 retail units, bars, restaurants and leisure facilities. At the heart of this project is a state-of-the-art, sustainable student accommodation complex. Situated upon a rooftop terrace approximately 15m above street level and comprising of 993 bedrooms in 8 blocks varying from 4 to 8 storeys high, Trinity Square will be able to house over 1,000 students from Northumbria University. It will offer a choice of studio apartments and accessible bedrooms all attached to a “Student Hub”. With such vastly different areas to light in the 345,685 square foot complex, illuminating it inevitably required a wide variety of luminaires to provide the necessary levels and quality of light. In addition, emergency lighting was required throughout the building to illuminate exit routes and comply with BS5266-1 : 2011. Energy efficiency and sustainability have been major considerations in the development. The Gateshead Sustainable Energy Action Plan outlines how Gateshead Council will reduce carbon emissions in the borough by 20% by the year 2030. In addition, the Trinity Square project has been designed to achieve a BREEAM rating of “Very Good” which sets the standard for sustainable building design, construction and operation. All lighting systems and fixtures must adhere to strict efficiency codes without compromising performance. Ringtail Lighting’s XL Circular Internal and XLP Circular LED Internal units have been supplied for use in all bedrooms, staircases and corridors in the complex. Our XL and XLP units have all been supplied with a bespoke housing tray especially designed to meet specifications of the Trinity Square lighting system. Bedroom lighting must be provided in accordance with CIBSE recommendations, therefore our dynamic XL Circular Internal units have been supplied with a bespoke diffuser which facilitates and improves light transmission by up to 54%, without compromising efficiency. Lighting contributes immensely to wellbeing and high levels of good quality light will significantly improve concentration and reduce fatigue. Many of our XL units are equipped with intelligent micro-sensors which dim luminaires to 10% of their output when un-needed or un-used, instantly switching to full output when required. Lighting can be responsible for up to 40% of a building’s electricity use. By specifying luminaires with an integrated micro-sensor with the ability to provide daylight dimming or occupancy detection, electricity consumption and running costs can be dramatically reduced. Over 4,000 Ringtail Lighting products have been installed in the Trinity Square student accommodation development. Not only will these products create a warm, well-lit and secure environment, they will aid in minimising the building’s on-going costs through the use of energy-efficient and maintenance-free lighting.